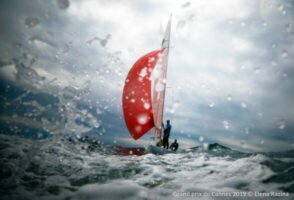 After overnight thunderstorms, it took a while for the wind to finally settle in the west, but once it did the race committee got racing underway in big seas and sparkling conditions. 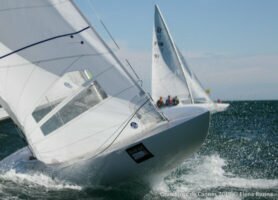 With a base of 20 knots and gusts regularly heading up towards 30 there were several retirements, but those who forged on were rewarded with a thrilling and incredibly close race. Sadly the wind became too strong for race five to be attempted. The Corinthian team of Maximilian Dohse, Rasmus Nielsen, Thomas Dehler and Philip Hibler from Germany stormed the first beat to lead at mark one, with Hugo Stenbeck from Switzerland, Russia’s Yevgeny Braslavets and Portugal’s Pedro Andrade hard on their heels. Overnight leader Thomas Müller struggled off the line and did well to recover to twelfth, while Britain’s Grant Gordon was black flagged and sent home. As the boats battled their way around the course positions were constantly changing and it wasn’t until the closing moments of the race that the final finish order was decided. Used to sailing in the big Atlantic waves and strong winds of Portugal, Pedro Rebelo de Andrade and his crew of Goncalo Ribeiro, Joao Vidinha and Kacey Marfo, gradually ground their way to the front of the fleet, taking victory on the line from Stenbeck with Dohse third, Russia’s Anatoly Loginov fourth and Germany’s Marcus Brennecke fifth. 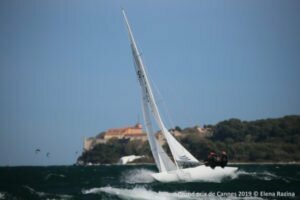 Completion of the fourth race saw the single scoring discard come into play and as a result Pedro Andrade now leads the regatta by two points. Thomas Müller discarded his twelfth place and holds onto second overall with a three point delta over Marcus Brennecke in third. Grant Gordon dropped his black flag and sits in fourth place overall, three points behind Brennecke and just one point ahead of fifth placed Hugo Stenbeck. In the Corinthian Division Germany’s Tanja Jacobsohn leads Sweden’s Karl-Gustav Löhr, with Maximilian Dohse in third place. Maximilian Dohse wasn’t the only Corinthian giving the professionals a run for their money today. Sami Salomaa and his crew of Kalle Pihl and Jari Bremer dug deep and carved themselves out a well deserved tenth place and were delighted with their result. By profession Sami is a sculpture and is the man behind the stunning new Dragon European Cup trophy, which will be presented to the winner of the Grand Final in November. 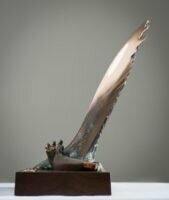 The name Sami has given to the sculpture is Flow and after racing he explained that it is his interpretation of those very special moments when man, yacht, waves and wind are in perfect harmony. The success of the Dragon Class has many facets and it is the careful balance of those facets that has been the key to the class’s 90 years of success. The exceptional quality of the competition is obvious to all, but what is perhaps less clear to the outsider is the terrific diversity of the class. 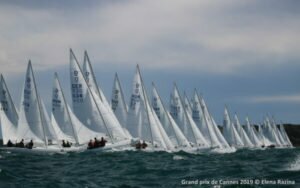 Many of those competing this week are family crews or rivals and there is a wonderful mix of professional and amateurs, young and old, male and female, experience and new sailors all coming together to enjoying everything that this wonderful fleet has to offer. Maximilian Dohse is a classic example of a young person who enjoys Dragon sailing with his friends and he is also someone who comes from a truly committed family of Dragon sailors. His father Philip, a past Vice Chairman of the International Dragon Association (IDA), and mother Nicola are also racing here aboard their Dragon Puck IV and Max has been sailing Dragons since he was a small child. IDA Chairman Vasily Senatorov is racing against his brother Mikhail, while Peter Gilmour is crewed by his son Sam. There are two more husband and wife teams on the water in the shape of Tanja and Bernard Jacobsohn from Germany and Ron James and Julia Walsh from the UK. And there are many others whose family connections to the class go back decades. With 16 nations represented at this regatta alone the class is also incredibly culturally diverse and lifelong friendships are forged across the globe. The youngest competitor this week is 13, whilst the oldest is well into his 70s. 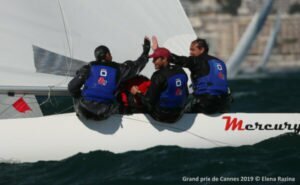 Another very familiar Dragon family member whose connection with the class stretches back to childhood is International Judge Yves Leglise, Chair of this regatta’s International Jury. Yves first worked with the IDA 40 years ago when he was asked to translate the class rules into French for the first time in 1979. But he fell in love with the Dragons long before that as a small boy growing up in Arcachon, home of one of the oldest French Dragon fleets. After that first translation job Yves was asked to become an IDA Measurer, he chaired the Race Committee for a European Championship, and then, when his qualification as an International Judge became known, he was regularly invited to chair International Juries for major events. 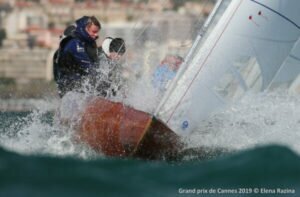 40 years on he has chaired the jury for ten Gold Cups, seven European Championships and five World Championships as well as numerous Grade 1 and National Championship regattas too. As well as diversity among the sailors there is also terrific diversity among the boats too. Dragons have always been built to the highest of standards and exceptional and farsighted rule management has helped to ensure that well maintained boats of any age can continue to race at the highest level. The oldest boat racing this week is the Latvian entry Avelat, which was built in 1963 and is beautifully maintained in Concours d’Elegance condition. Helmed by top Russian Yngling sailor Anna Baskalina, her varnished topsides make a striking image as they break through the deep blue Mediterranean waves. An elegant and relaxed après sailing scene is another key element in the Dragon’s success and post racing the competitors came together for a fabulous Gala Beach Party, drinking, eating and conversing with their toes in the sand as the sun set behind the Esterel mountains. 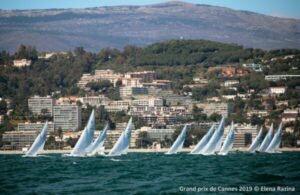 The regatta concludes on Friday 5 April when a maximum of two further races can be sailed, bringing the total to six possible races. The forecast for the final day is for wall to wall sunshine and WSW winds building from around 10 knots in the morning to 20 knots and gusting in the afternoon. Racing is scheduled to start at 11.30 and there is a final start cut off time of 16.30.